There are some good looking rain barrels out there, but they can be pretty expensive. I can understand the decorative ones that look like terra cotta pots or whisky barrels costing around $200 or more, but even the simple looking industrial looking ones are usually over $100. 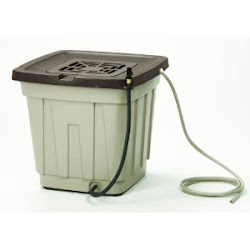 When I was looking for information on hose reels I noticed a new product on Suncast's website. Suncast now has a 50 gallon rain barrel. I have to say, I really like how it looks. It's not as pretty as the fancy rain barrels that look like pottery and have a planter on top, but it doesn't look like industrial garbage either. The best part is it comes with everything you need and is less than $100 including shipping. That sounds pretty good to me. Even if you got a 55 gal garbage can from the hardware store, the bulk fitting, spigot, and other assorted components and put it together yourself, you wouldn't save much and it wouldn't look as nice. The Suncast Rain Barrel looks like a winner in my eyes.